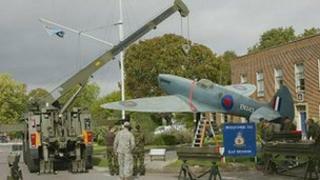 A refurbished replica spitfire has been unveiled outside an Oxfordshire RAF base at a rededication ceremony. The gate guardian at the entrance to RAF Benson is a memorial to crewmen who died in World War II. It has the markings of Flt Lt Duncan McCuaig DFC who died conducting a photographic reconnaissance mission over Bremen in Germany. His daughter Karen MacDonald and veterans of the RAF's reconnaissance crews were among the guests of honour. Ms MacDonald, who was two years old when her father died, said: "We are incredibly proud to be part of the RAF scene that Duncan was part of." Flt Lt McCuaig was part of the Operation Crossbow team involved in gathering intelligence from aerial photography. Ms MacDonald was joined by four children and six grandchildren for the ceremony. "I was on the verge of tears, but am terribly proud this is happening - there is a natural closure," she added.